Room Refresh! 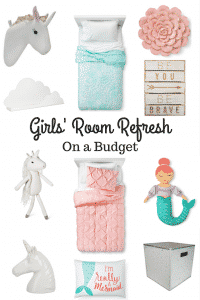 Budget Friendly picks from Target! Time for a room refresh? Check out Target!! Their Pillowfort Line features adorable budget-friendly. Even better, there are often deals and promotions. You can check out what is currently featured here. We absolutely LOVE the unicorn and mermaid lines. Check out our top picks below – everything it clickable and will bring you right to the item! Both comforters shown, the Aqua Bird Scalloped Comforter and the Light Pink Pinch Pleat Comforter seem to coordinate well with either the unicorn or mermaid theme. If you don’t love the Pillowfort sheet options (they are polyester, but very reasonably priced), check out the Pottery Barn Kids White Sale that started today (free shipping with promo code SHIP4FREE). The Organic Rainbow Sheet Set would complement the unicorns nicely! (on sale for $49). Target offers an Extra 5% off and Free Shipping with RedCard. You can check out all of the benefits of RedCard here. Otherwise shipping is free with a $35 purchase or you may be able to select store pick up. The Target Kids’ Home Sale is only through tonight (6/8/2017), so check it out! You can shop the whole sale here! Previous Post Expired: Tea Collection Swim Sale! 50% off! Next Post Roomba Deals are Back! Better than Black Friday Prices!